When a small NASA-funded rocket launched off planet Earth this month in a dazzling liftoff, it wasn't headed for the final frontier. Instead, the rocket had a closer target: the northern lights dancing over Alaska. A NASA-funded sounding rocket launches into an aurora in the early morning of March 3, 2014, over Venetie, Alaska. The GREECE mission studies how certain structures — classic curls like swirls of cream in coffee — form in the aurora. 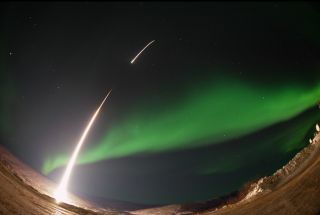 The sounding rocket launch, which blasted off on March 3, was part of the NASA-funded Ground-to-Rocket Electrodynamics-Electrons Correlative Experiment (GREECE for short). The launch sent the rocket streaking through so-called "auroral curls" inside the northern lights display. The curls are ethereal shapes that look similar to cream swirls in a coffee cup. The NASA-funded Ground-to-Rocket Electron-Electrodynamics Correlative Experiment, or GREECE instruments travel on a sounding rocket that launches for a ten-minute ride right through the heart of the aurora reaching its zenith over the native village of Venetie, Alaska. To study the curl structures, GREECE consists of two parts: ground-based imagers located in Venetie to track the aurora from the ground and the rocket to take measurements from the middle of the aurora itself. "Our overarching goal is to study the transfer of energy from the sun to Earth," Marilia Samara, a lead investigator and a space scientist at Texas' Southwest Research Institute (SwRI), said in a statement. "We target a particular manifestation of that connection: the aurora." The 10-minute flight above Venetie, Alas. was intended to take measurements of particles and electric fields inside the aurora, which are then compared to pictures taken from the ground. The researchers are trying to understand how the curls form out of the plasma (superheated gas) inside the aurora, which would give more clues as to how the sun interacts with Earth's magnetosphere. "Auroral curls are visible from the ground with high-resolution imaging," said Samara. "And we can infer from those observations what's happening farther out. But to truly understand the physics we need to take measurements in the aurora itself." Auroras are created when particles from the sun bombard the Earth, hitting oxygen and nitrogen about 60 to 200 miles (97 to 322 kilometers) above the planet's surface. Earth's magnetic field funnels the solar particles toward the poles, where the interactions can generate curtains of light visible from the ground or from space. The sun is at an 11-year maximum of activity and recently, several large solar flares erupted from its surface. While curls are still poorly understood, researchers have a couple of ideas about how they form. One theory says they could be created by the Kelvin-Helmholtz instability, where high- and low-speed flows mix. The same phenomenon creates "surfer waves" on a beach, NASA stated. The curls could also be created by Alfven electromagnetic waves, which are only generated in plasmas. Participants in the GREECE study included SwRI (which created the particle instruments and ground-based imagers), the University of California, Berkeley (which is measuring the electric and magnetic fields) and NASA's Wallops Flight Facility (which provided a supporting sounding rocket team). The rocket launched from the Poker Flat Research Range, an operation of the University of Alaska, Fairbanks.